I was recently speaking to a major funder about team effectiveness. It’s an area that can make such a difference to enjoyment at work and the performance of the whole organisation, especially if it’s the top teams doing the work. Our team effectiveness framework is one of the tools we find resonates with management teams and boards and it’s our pleasure to share it with you. The framework has 5 core components, with an enabling additional piece. As you consider each component it is helpful to reflect on what level of clarity and collective buy-in there is in your team. Goal – This is what is collectively defined as success. It should be co-created by the team. 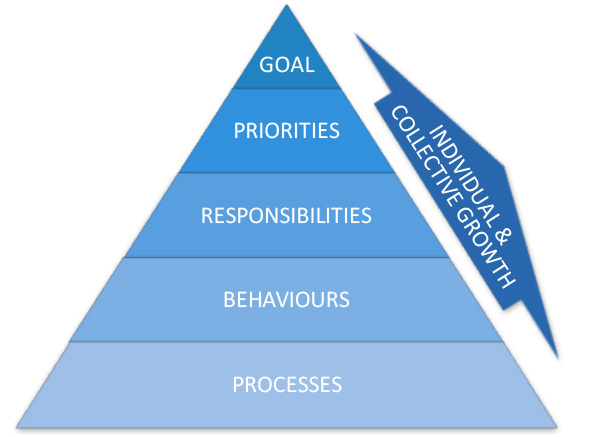 Priorities – This provides the team with focus; without it teams become too busy or fragmented. Responsibilities – Explicitly defining what is the responsibility of the team vs individuals within the team often removes sources of ambiguity which can contribute to interpersonal tensions. Behaviours – Values need to be translated into executive behaviours. How must we behave as a team if we are to achieve our organisations aspirations? And what will we do, for and with each other, in the moments when we inevitably depart from these behaviours? Processes – Processes often do the heavy lifting that makes relationships work. This step involves defining the enabling processes that oil the wheels of effective leadership. Individual and Collective Growth: As one expert puts it, ‘our greatest mentors are our colleagues’. When we are in a highly effective team we are on an explicit growth journey individually and collectively to become our best version of ourselves. Defining this creates the momentum for it. Not all teams need to focus on all areas. Sometimes it’s just a critical tweak in one area that creates the change, and a team off-site is often great way to kick off the work. After working with 35 organisations or more now, our experience is that running a team through this framework, like a health check, provides the kind of grease and oil change that takes performance to the next level. We’d love to hear how the framework resonates for you! Feel free to email us with any questions.